We had fun with those. It doesn’t scare the birds away because there’s no shotgun sounds. So there, another group comes. In the past hunters used bolas to bring down flying ducks and geese. The weights fanned out as they flew through the air, and with the slightest touch wrapped themselves around a bird. Roger Silook said about hunting oldsquaw ducks, “These birds fly real low, and when the moon is shining bright the men use their bolas to catch them. It is the best exercise I know” (from Stories the Old People Told on St. Lawrence Island, 1976). 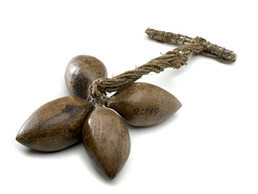 Bola strings were made of sinew, and the weights were usually walrus ivory or bone. Wooden balls, as on this set, were used over water. Ralph Apatiki, Sr.: Taawa ukut aatghii qawaagmun atut neghiighhaaneng elngatall liisalghiikut. Taana avleqaghtaq mumiglleghhiini qerngunun qawaagnun atuuftut. Jonn Apassingok: Aamtayaq neghusiqegkiit aagkut sivunemnta. […] Tawaten apellghistun entaqun qernguqunghani qawaaget sangwaat metghaat alpat. Tamagun milughluki tespaagani legan iglagutqaghtesluki. Tamagun qawaagsimaqut tamaani. Jonn Apassingok: Piighhegkat tawaten ivalumeng uliimakaaftut ukut avleqeghtat […] Uum puungi llangaqa taawa ayveghem ungaganeng. Nemghwaaghluteng ayuqut. (This set of bolas was also made with braided sinew. […] This one’s handle seems to be of walrus whiskers. Angela Larson: Naqamllu ayveghem ggutangi atiigatatki. John Apassingok: Aa entaqun atughaqiit. Christopher Koonooka: Kinguliit enkaam Tuugghinkut kinkut uliimaghit spark plug-meng atuqluteng. John Apassingok: Tugutetwha sangwaat ggutet quutmi atughaqegkangit. Merlin Koonooka: Ukut maaten esghaghyaqeput unaghsighhaaftut. Uqengestaghhaat unaghsit. Enkaam piyalghiikut llangaqa meghmi sami angyaami atughqaaluki. Meghqunllu aagllakayuk qawaak. Qantaghaqun aakayuget. John Apassingok: Pugleghesqelluki unaghsimeng. Angyameng sakun qayakun entaqun tugaghesnaghaqluki. Branson Tungiyan: Qiighqameng pinyuut [they are from the Island]. Normally, St. Lawrence Islanders use ivory or bone. It’s surprising to see wooden ones. These have sinew thread. At the end is a group of bird-wing feathers tied together. Estelle Oozevaseuk: They say with that, they can go straight, something to guide with. And the old women used to braid this [sinew], adding their hair so they can better entangle the birds. Aron Crowell: Could wooden ones be for use out on the water? These were recorded as being for geese. Branson Tungiyan: They used a lot of these wooden or ivory ones when the eider ducks were going overland. But I guess the wooden ones are used in the water. Aron Crowell: How recently have those been used on St. Lawrence Island? Branson Tungiyan: As late as the late 1950s. Estelle Oozevaseuk: Yes, younger boys still try to use them. Some of them would like to learn about how to use them. My brothers, when I was growing up, they always try to use this. Bill Fitzhugh: Did they carry them in any special way? Estelle Oozevaseuk: Yes, they put them around their necks. Branson Tungiyan: It’s easy to get them off whenever you see a flock. We had fun with those because it doesn’t scare the birds away, because there’s no shotgun sounds. So there another group comes. They see a duck going down, and you chase them. But boy, they’re fast too. But we were very able to get them. Estelle Oozevaseuk: The women liked the ones that had been killed by bolas like that—the birds with no holes, with no wound—because they saved the skins all the time for parkas and other things. The bola is a throwing weapon for ducks and geese.Hunters whirled a bola overhead and released it into a low-flying flock.The weights wheeled through the air and with the slightest touch would wrap themselves around a bird and bring it down. Bolas lost popularity after shotguns became available in the late 19th century, but Elders who are alive today still used them when they were young. (3)Oldsquaw ducks were one kind of bird they hunted.Roger Silook of Gambell said that sometimes “these birds fly real low and when the moon is shining bright, the men use their bolas to catch them. It is the best exercise I know of . . . .”(4)Bolas were also used for sport; one man would throw his into the air and others would try to hit it with theirs.